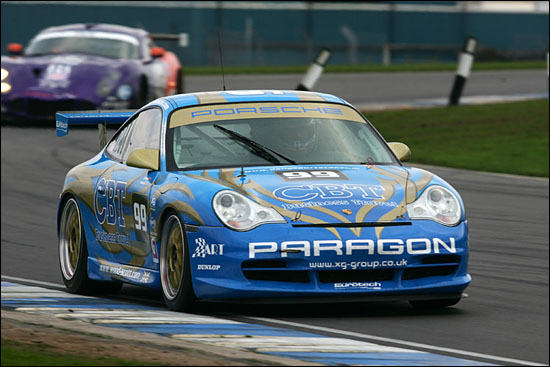 Sunny weather at Donington Park saw the racing debut of the brand new look for the #99, Cambridge Business Travel-backed, Wood-Scott Racing Porsche 911 GT3, in the first round of the 2005 British GT Championship. 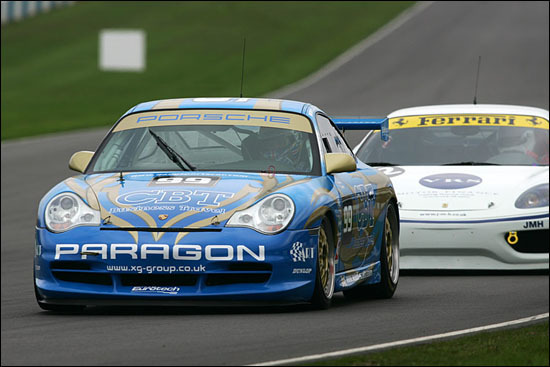 Stuart Scott and Steve Wood were back for more, together with a bumper GT3 class grid of 15 cars. The newly re-liveried, but still Eurotech prepared, #99 looked a real stunner among the legion of Porsches (and Ferraris) on display. Qualifying showed just how closely fought this season is likely to be, with just three seconds separating the top 13 GT3 starters: the #99 car would be towards the back of the pack, but with a full two hours of racing ahead grid position means little. 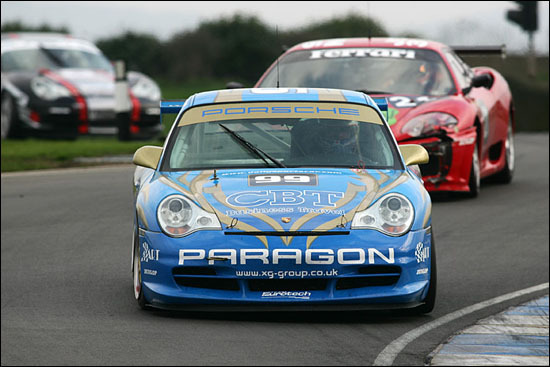 For Sunday’s race, Stuart would start the car - and midway around the opening lap the CBT boss would encounter a multi car melee, which included the unfortunate Keith Ahlers Morgan, parked facing the wrong way in the face on the oncoming pack (the two racing together later in the race, below). Stuart escaped unscathed and picked up ground and track positions into the bargain. With so many newcomers to the championships, a waiting game was the wise option, because a race of attrition seemed likely. 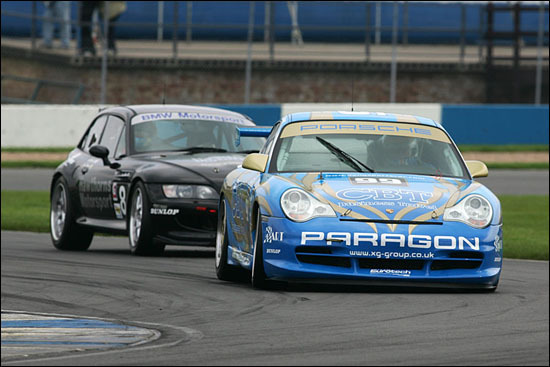 After a season learning the peculiar challenges of finding a race pace in a Porsche 911, Stuart was finding confidence and pace with every lap. 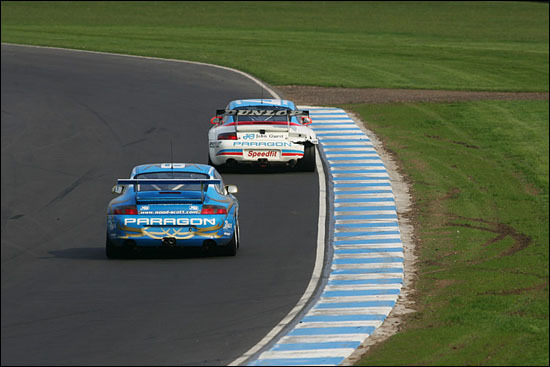 #99 was passed over to Steve Wood in very good order at almost the halfway mark in the race, and the ex-BTCC campaigner was off and running immediately. There was immediate disappointment though, as the car was penalised with a drive-through penalty, after the pit crew mistakenly changed tyres during the fuelling window - when only fuel and a replacement driver can be added. 30 seconds or so were lost in a frustrating grind down the length of the pitlane. Some quick lappery straight afterwards found Steve consolidating an already secure position, picking off cars as several GT2 and GT3 runners found the going too tough. 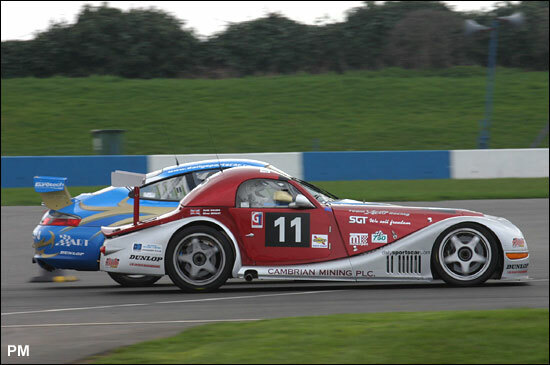 “I was passed by Mike Jordan in the #77 Eurotech GT2 Porsche and he’d taken a smack up the rear, the bodywork had a big hole punched in it and I could clearly see a groove gouged into the tyre, almost down to the canvas, by a bit of bodywork. I got onto the radio and let the lads know.” That piece of well observed information might just have saved Jordan from a damaging accident. “The rear left hand suspension failed when he was at full tilt, he did fantastically well to gather it all up and pull off.” Bad news for Warburton, but good news for the #99 squad, another place picked up. By the flag, a very solid and trouble free race had scored a valuable points finish for Stuart and Steve, 16th overall from a 26 car grid and eighth in what looks like being a hugely competitive GT3 class. 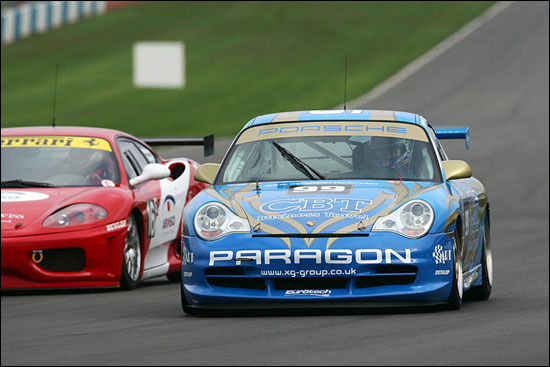 Next up Croft and the first ever standalone GT3 only race in the Championship.